The City of Delaware Parking and Safety Committee voted in favor of recommending to City Council that the west side of Channing Street between East Central Avenue and East William Street, right side of picture, be a no parking zone on school days only between the hours of 7 a.m. and 4 p.m.
Parents or caregivers who drop off or pick up students at Conger Elementary School on the east side of Delaware might have to change their routines for the sake of safety. During a City of Delaware Parking and Safety Committee meeting on Monday, committee members voted in favor of recommending to City Council that parking on the west side of Channing Street between East Winter Street and East Central Street be prohibited between 7 a.m. and 4 p.m. on school days. The request for the no parking zone was brought to the committee’s attention by Police Chief Bruce Pijanowski, who said while patrolling the area during drop-off and pickup times, officers have observed a number of commuters who stop on the southbound side of Channing Street and wait for students instead of using the school’s new parking lot on East Winter Street. 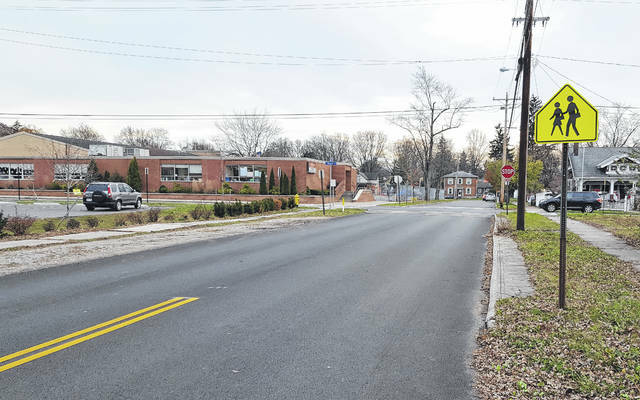 Pijanowski added that parking is currently prohibited on Channing Street between East Winter Street and East William Street, so the measure being brought before council would extend the no parking zone north to East Central Avenue. The main objective of the no parking request, he added, is to keep the roadway clear and safe for everyone. If council approves the installation of “no parking” signs for the remaining portion of the west side of Channing Street where parking isn’t already prohibited during school days, Pijanowski said, his officers will work with parents since the department understands the areas around the city’s elementary schools weren’t designed to handle the amount of traffic the increase in student enrollment has caused during drop-off and pickup times. “We are trying to find a happy medium there between getting the kids in and out safely and managing traffic,” he said. During council’s annual organizational meeting on Monday, council members Carolyn Kay Riggle (at-large), Kent Shafer (at-large), George Hellinger (at-large), and Jim Browning (3rd Ward) were all sworn in after being re-elected to their respective seats earlier this month. After all four members took the oath of office, Browning nominated Riggle for the position of mayor (selected by council from among the at-large members), a role she’s held since 2013. Council unanimously voted in favor of extending Riggle’s time as mayor for another two years. Shafer, who has served as vice mayor since 2015, was nominated for another two-year stint by council member Chris Jones. Council unanimously voted in favor of Shafer continuing to fill the role.